It’s free, short and totally excellent. This short guide on how to write for websites will give you a few tips and encouraging words to get you writing for the web. Good writing on the web serves a purpose. Words inform, inspire, entice and sell. But web writing doesn’t need to qualify as great writing in the literary sense. So don’t try to pepper your writing with unusual words or poetic touches. You’ll be more successful if you focus on communicating with your audience. When you write, keep your reader at the forefront of your mind. Who are they? What do they want? Your writing should fulfil your user’s needs. Imagine you’re buying a lawn mower. What do you really want? Do you want a machine that cuts grass or do you want shorter grass? You really want shorter grass; the machine is just a means to an end. Your readers just want shorter grass. The need to give readers clear benefits applies to all kinds of communications. 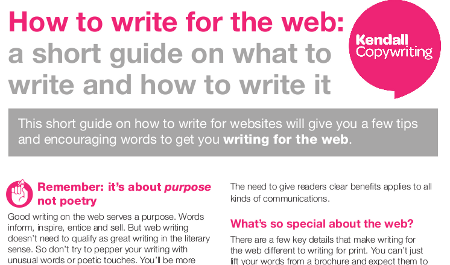 There are a few key details that make writing for the web different to writing for print. You can’t just lift your words from a brochure and expect them to flourish on the web. Break up blocks of text with headings. Hyperlinks, or links (the clickable text that leads you from one web page to another) are one of the webs defining features. Use links to provide evidence for your claims, support for your argument or additional resources for your readers. Unless your website is optimised for search engines, you could miss thousands of potential visitors. Start by thinking about how people search for a business like yours. Draw up a list of words and phrases (keywords) that people are likely to use. Then copy and paste your list into Google’s Keyword Tool. This will give you a longer list and should include words or phrases you hadn’t originally considered. You may have a massive list, but you can’t hope to rank well in search results for hundreds of keywords (unless you’re Amazon or the BBC) so focus on the most important keywords. Choose keywords that your customers are likely to use when they’re ready to buy from you, rather than keywords that indicate a searcher looking for information. For example, if you search for ‘puppies’ you might be looking for pictures or general information about juvenile dogs. But a search for ‘puppy farm’ is more specific and more suggestive of someone who’s ready to buy. With SEO, it’s easy to get obsessed with keywords and search results. While it’s wise to understand SEO, you must write for people. Focus on your human audience. If you publish interesting things on the web, people will link to your writing. This is a better, more natural approach to SEO. If you want people to find your writing, you’ll need to get in front of their eyes. 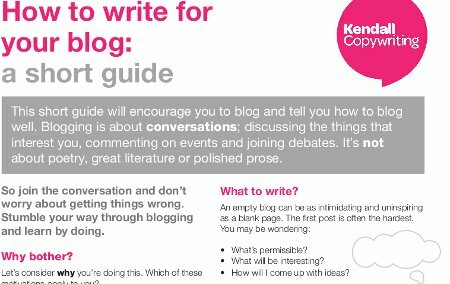 Write comments on other bloggers’ posts, use social media tools like Twitter and Facebook, and contribute to forums (make sure your signature includes a link to your website) to help people find your website. Every link to your website has two values: it helps people discover your work, and it improves your website’s search engine performance (search engines consider links to your website to be an indicator of quality). Be nice to your readers: use a spell checker and ask a friend to review your work. Let your words rest overnight before re-reading to make sure they still make sense. The secret to great writing is regular practice. So get writing! Remember your reader; what do they want? Remember your desired result; what do you want to achieve? Highlight how features translate into benefits. Use white space, headings and sub-headings to break up text. Lead people to your website with links and mentions on forums, blog comments and social networking sites.